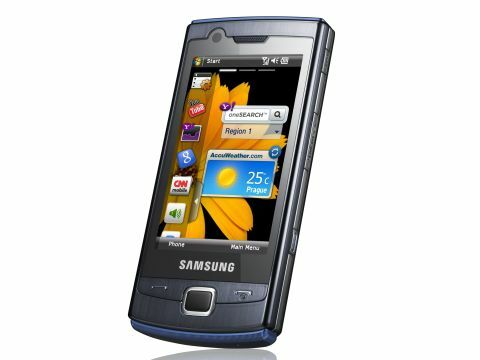 Samsung has been busy of late updating it smartphone portfolio, with the Omnia Lite B7300 one of several recent Windows Mobile 6.5-powered handsets to line up in its Omnia range. The 'Lite' moniker may suggest a lower spec'd, handset, and Samsung bills it as a 'simple all-rounder'. But running the latest version of Microsoft's smartphone operating system, and ticking off plenty of features, the Omnia Lite B7300 has much more gadgetry under the bonnet than its name might suggest. The Samsung Omnia Lite Windows Phone uses a 3-inch touchscreen, with Samsung's TouchWiz 2.0 Widgets-enhanced user interface brought in to skin the Windows Mobile 6.5 Professional OS. It supports HSDPA high-speed mobile data connectivity and has Wi-Fi onboard too. It's equipped with A-GPS satellite positioning technology, working with onboard Google Maps software, and comes loaded with a decent suite of Windows Phone applications, including Word Mobile, Excel Mobile, Powerpoint Mobile, Outlook, Internet Explorer and Windows Live, with support for Microsoft Exchange for push email from corporate servers. Samsung has brushed up on the multimedia side of things with a media player that includes support for DivX and Xvid video file formats, while an additional Opera browser supplements the Microsoft Internet Explorer online browsing efforts. Its camera is a mid-range 3.2-megapixel shooter, though, rather than one of Samsung's more up-market snappers.